You don’t see a lot of veggie recipes here at EE and I vow (along with eating better and being kinder and gentler) to posting a few more healthy side options for 2017. Here are the sides that I made to accompany the Garlic Lemon Chicken that I delivered to my dad for a special Christmas Eve dinner. Steam green beans until just tender. While beans are steaming, heat olive oil in a large saute pan or skillet. Add mushrooms and saute until just starting to wilt. Add garlic and saute 1 minute more. Add beans to mushroom and garlic mixture and toss. Season with salt and pepper. In a large kettle, bring 2 quarts of water to a boil. Trim cauliflower and break into flowerets. Drop into boiling water and cook about 2 minutes. 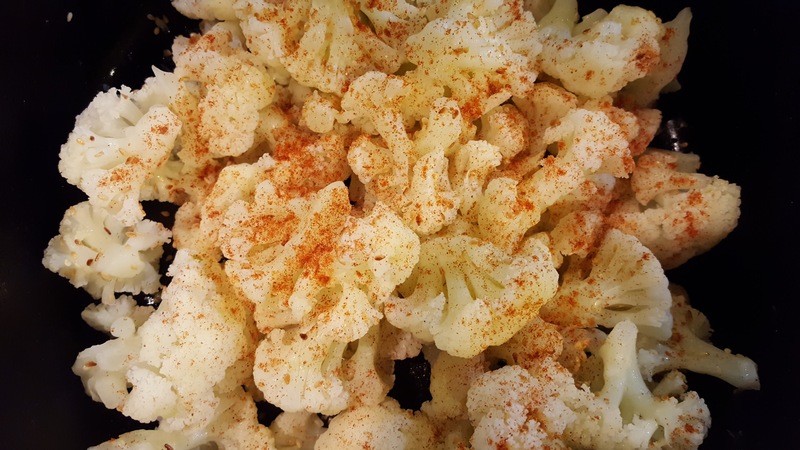 Drain cauliflower in a colander. In a large, non-stick skillet, heat oil and toast garlic (about 1 minute). Add cauliflower and sesame seeds and saute for 1 minute more. Dust with paprika and pepper before serving. In a medium saute pan, heat olive oil. 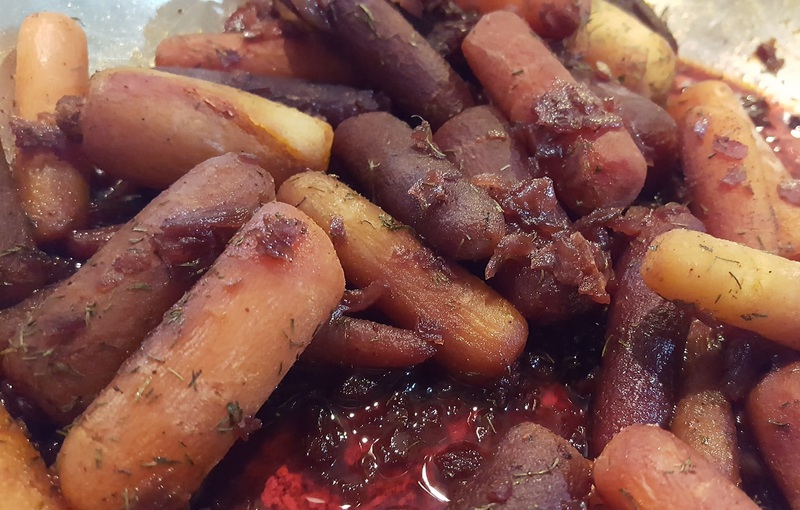 Add carrots and dried shallots and stir. Saute over medium heat briefly. Season with salt, chili powder and pepper. Add wine and maple syrup. Stir. Remove from heat and toss with dill weed. Serve. Again, this meal and visit was one of the highlights of the holidays for me. I also made some low-sugar muffins and no-sugar cake that I will post soon to round out this holiday meal. Stay tuned for some other healthy dishes as The Hubs and I are trying to eat better and lose a bit of weight the first three months of 2017. 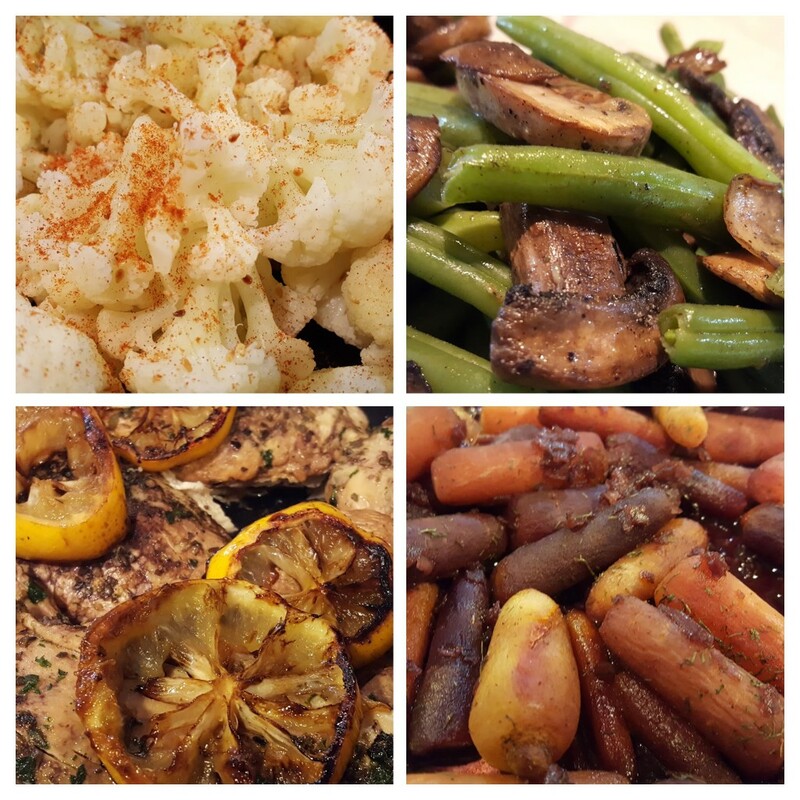 We’ve been eating as unhealthily as we could for the last few weeks (love the holidays! ), so now it’s time to change course. These look great — just what we need! 🙂 Happy New Year! 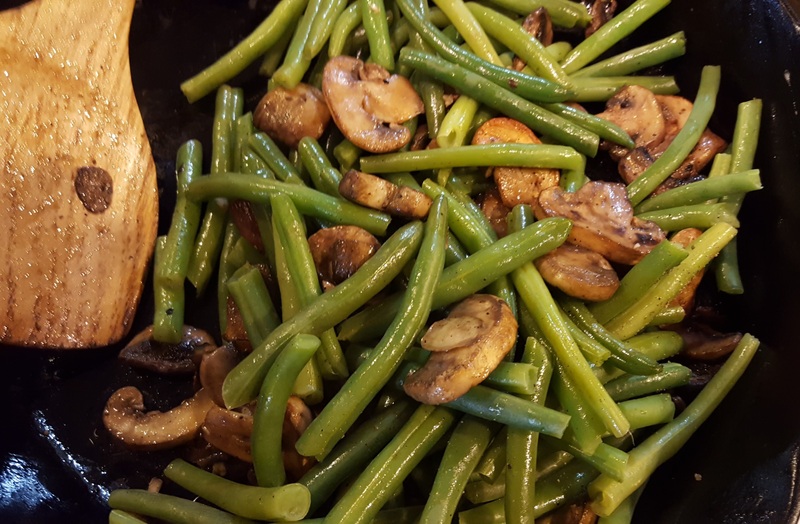 I eat LOTS of veggies every single day…love that green bean mushroom stirfry. Must give it a try soon. Know what you mean about eating more vegetables. The holidays were disastrous for getting enough vegetables; however, loved all of the carne adovado, tamales and posole. 🙂 Thank you the inspiration of getting back on the veggies track with these recipes. We accidentally went vegetarian in September and my husband has lost 17 pounds and I have lost 12. 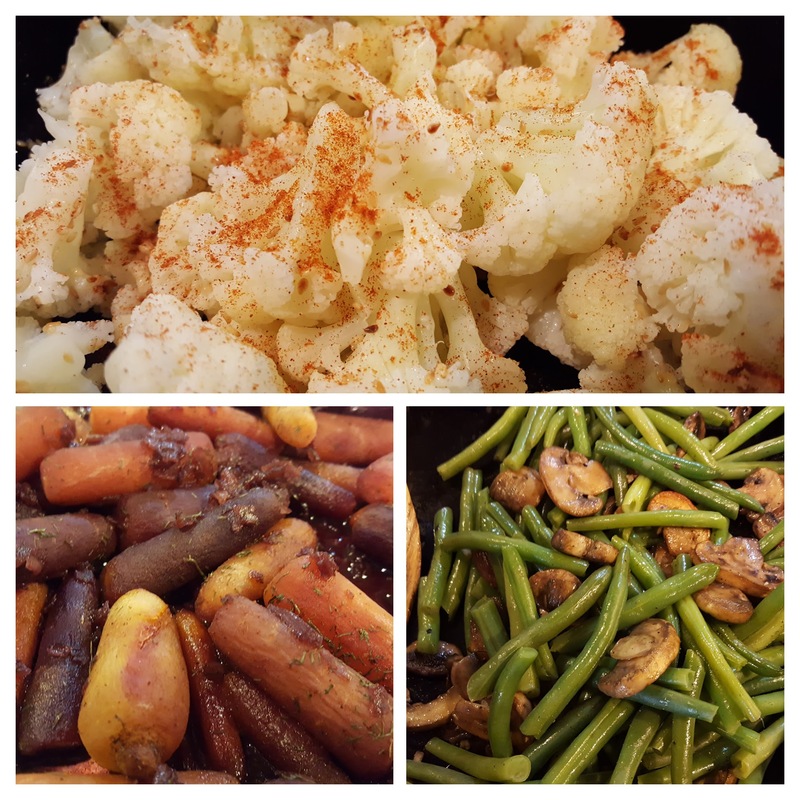 We planned the Flexitarian diet, having meat only 2 times a week, but found we loved the new veggie meals. So many people think it’s just a plate of vegetable side dishes but I have made mousaka and enchiladas and more. Plus we switched to Almond milk. Wasn’t sure about that change but it’s great. Way fewer calories. I will be making that cauliflower dish to go along with fish. We do eat seafood too. These all sound so delicious. Your dad must have been so happy and satisfied with this meal.